The Children’s Play area was designed with the idea of creating an environmentally friendly area for children to play in. Natural themes, to create environmental awareness in children, were chosen. So far these themes have included ‘Life in the Leaves’ in the form of a jungle gym and ‘Soil is life’ in the form of a sandpit. 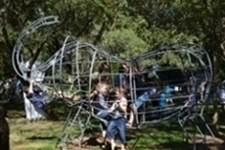 Two giant steel elephants are the latest addition to the children’s play area which enables healthy development for kids as well as an opportunity for them to engage in fun exercise, encouraging them to use their imagination and creativity to direct their own fun while navigating through the elephants. 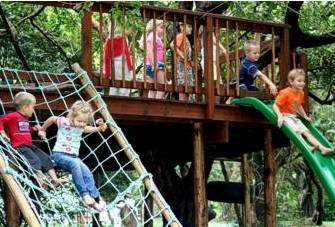 The jungle gym and obstacle course unit provide hours of fun for children and allows us to accommodate even more children. Parents can relax nearby with a picnic basket or at the tea garden, making it truly a Garden for all. 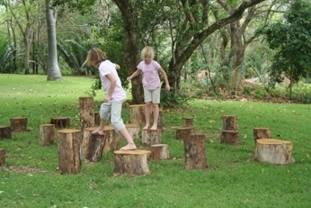 The log obstacle course was built with wood from trees that had to be removed. Every attempt is always made to ensure that natural materials are never wasted. The Garden plans to enlarge the play area in the future. If anyone is interested in helping us to create a bigger and better children’s play area please contact us on +27 (0)13 752 5531.